And this is how one would describe the one day ban on NDTV. 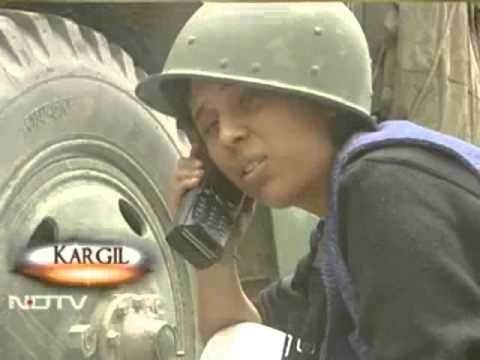 NDTV and Ms. Dutt portray their reporting of Kargil war as “cut my teeth reporting the Kargil war.” She credits herself with bringing Kargil to the comfy sofa of every Indian. a) She carried a satellite phone in Kargil, which made her location traceable, an Iridium instrument. She was the only journalist with a sat-phone. Even army officers with satphones were not present in conflict zones. The Pakistanis spotted the light and had a fix on the location. Five minutes after she leaves, artillery rains the place leaving an officer and 3 jawans martyred. c) After the Dy. Brigade Commander at Drass, Colonel David, briefed BD on the progress of the actual assault on Tiger Hill, Barkha Dutt is reported to have gone live immediately. Indian intercepts of Pakistani military messages indicate that the Pakistani rear commanders immediately alerted their troops on top of Tiger Hill to redirect their fire in the direction of the Indian soldiers who were climbing Tiger Hill. About 14-20 of our soldiers were massacred by this deadly fire and died on the ropes they were using to climb their target. NDTV has been accused of giving out Army locations throughout the war, but she comfortably denies it. When Pakistani terrorists had captured hostages at three places, the elite Indian NSG commandos launched a counter-terrorist operation to flush them out. There is nothing wrong in capturing the heroics of NSG, except that it was aired in real time. “The coverage of the Mumbai attacks led to a situation where, on the one hand, the terrorists were completely hidden, and the security forces had no means to know their exact positions or the kind of firearms and explosives they possessed and, on the other, the positions of the security forces, their weapons and all their operational movements “were being watched by the collaborators across the border on TV screens and being communicated to the terrorists”. “In one instance Barkha Dutt asks a husband about his wife being stuck or held as a hostage. The poor guy adds in the end about where she was last hiding. My dear friends with AK-47s, go get those still in. And be sure to thank NDTV for not censoring this bit of information. In another instance, a General sort of suggests that there were no hostages in Oberoi Trident. possibility of 100 or more people still in the building. Hello! Guys with guns, you’ve got more goats to slay. But before you do, you’ve got to love NDTV and more precisely Ms. Dutt. She’s your official intelligence from Ground Zero. When Barkha Dutt, Rajdeep Sardesai, and others were questioned, their simple counter was that govt failed in keeping them away from ground zero. When Pakistani terrorists attacked an Indian Air Force base at Pathankot, media swarmed the place. However, learning from their previous mistakes, the army did not allow them in while the counter-terrorism operation was on. But, alas, NDTV did not learn. The anchor and correspondent of NDTV gave away information about the number of terrorists holed up in a building situated in an area meant for Air Force personnel and details about how the army was planning to take them down. The news coverage also revealed details of an arms cache, the ammunition stockpiled at the airbase, of MIGs and fighter-planes, and fuel tanks that the terrorists could attack. These details were not provided in the government briefing given during the attack. There are innumerable instances where NDTV has compromised national interests, especially in Kashmir. But they did not learn. It’s not that they were banned out of the blue. They had been given warnings before. The UPA government issued “advisories” to TV channels twice in 2008 and once in 2009 telling them to desist from reporting details that would give away the location and movement of security forces during anti-terror operations. The present government came up with similar dos and don’ts during March 2015 anti-terror operations. But it seems that NDTV did not seem to care. Their arrogance that they are above the system led to this day. NDTV always had the option to approach the courts if they think their Fundamental Right has been violated and take a stay on this order. After all, it wouldn’t have been a tough task for NDTV which has hired a gang of lawyers. What would have Rahul Gandhi done, if it was his govt in Center, and NDTV refused to comply with govt’s directives? Repeatedly putting the lives of army men at stake for cheap TRPs should not be tolerated at any cost, even if it is political cost and this is exactly what the govt is doing. EDIT: Some intellectuals have come up with this argument that it is the Hindi channel NDTV India which has been banned and not its English counterpart NDTV 24×7. Let me give you an example. There is this organization called Lashkar-e-Taiba headed by Hafiz Saeed. After 26/11, it had to be banned due to Indian and US pressure on Pakistan. Guess what; Saeed started operating from another front of LeT called Jamaat-Ud-Dawa. Now, was the India govt. Justified in asking for closure of JuD as well? After all, it was LeT and not JuD was the culprit. Should Hafiz Saeed’s crime counter be set to zero again? You get my point. Both the channels share the same information source and video footage. Many times, exclusive interviews and its outcomes are shared by both channels. Barkha Dutt’s frequent violations, the criticism that follows and govt’s directives should have made the likes of Ravish more careful as to not repeat the same mistakes for he indirectly carries the burden of Barkha’s actions. Tomorrow, NDTV may start a channel NDTV: Tejaswi Bihar and may flout rules there. At least you should have given them a warning before banning. PREJUDICE. Then, they may come up with NDTV: ISIS, repeat the same actions there. And one last thing from the comments section, everyone is entitled to his or her opinions. If you feel that someone is wrong, feel free to debate and suggest corrections. But ridiculing other people (12000 as of now), making judgments on people not sharing the same views as yours, looking down on others for holding a different perspective and shaming them as inferiors are what we call an Assault on Freedom of Expression. Originally shared by Aditya Tiwari, Published in public interest.